Here at Lakeland we’re big believers in making sure that our customers buy the right product for them so, before you go ahead and commit your hard-earned cash to purchasing a KitchenAid Artisan Stand Mixer, we thought it might help to understand a bit more about what’s behind the KitchenAid brand! Loved by the public and cooking professionals alike, KitchenAid have become such a household name that these days you really don’t need to be a baker to know their brand. 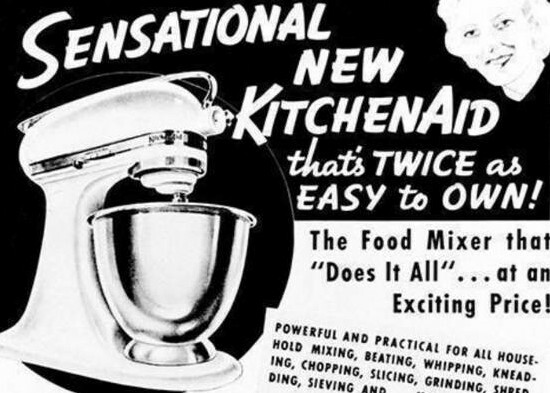 Originally founded in 1919 when they invented the first electrical egg-beater known as the H-5, KitchenAid soon built on their early success with the launch of their first electric Stand Mixer back in 1927. At the forefront of innovation – making electrical appliances that have revolutionised the way we bake and cook – the real turning point in the company’s fortunes came in the early 1940s, when they came up with a piece of kitchen kit which has proven to be one of the most instantly recognisable on the planet to date – the classic KitchenAid Stand Mixer. The result of a 3-year design collaboration with world-famous designer Egmont Arens, anyone comparing KitchenAid Stand Mixers from today to those built to Aren’s original design over 70 years ago will clearly see that they have a lot in common. A thing of beauty both now and then, the latest machines have evolved to incorporate lots of small tweaks to improve performance but, being solidly made from die-cast zinc and retro-styled to resemble those much earlier versions, their design heritage remains very much in evidence. Undoubtedly the most distinctive stand mixer on the market – if not the most attractive too – if you’re swayed by form as well as function, then the KitchenAid Stand Mixer’s timeless design is sure to put it right at the top of your wish list. Highly coveted and widely regarded as the epitome of kitchen cool, it’s not often that a kitchen appliance achieves the same level of kudos as the KitchenAid Stand Mixer. And you can bet that if you’re lucky enough to own one, it’ll live its life out on your worktop for all the world to see. An eye-catching icon of great design, it’s a perfect fit for style-conscious foodies – so it’ll come as no surprise that it’s dominated in the designer desirable stakes for tens of decades. Definitely not the cheapest on the market, the KitchenAid Stand Mixer’s credentials mean it sells really well despite its premium price tag and there’s no doubt that this is one aspirational lifestyle brand that we all want to buy into. The prestige of a brand and the product itself count for a lot when it comes to choosing a key investment purchase like which mixer to buy and, let’s face it, who doesn’t secretly love the idea of owning a KitchenAid! If you like to dress your home to reflect your mood and personality, you’ll be glad to know KitchenAid really don’t do drab and dreary. One of the boldest companies when it comes to introducing colour into our kitchens, KitchenAid have always had the edge on the competition when it comes to the choice of colours for their Stand Mixers. From bright vibrant hues to sophisticated metallic finishes, KitchenAid have catered for all different decors with their variety of colourways over the years. The first brand to deviate from plain white kitchen appliances back in 1955, they have continued to be champions for colour ever since. With a range of solid, pearlescent, matte and metallic colours to rival any paint chart, there’s nothing boring or ordinary about a KitchenAid Artisan Stand Mixer. And with so many colours to choose from depending on the model you choose, you’re sure to find a finish to match your kitchen and your personality. It’s easy to attribute the KitchenAid Artisan Stand Mixer’s success to its good looks and good marketing but the fact remains that it’s also a really good product in terms of technical performance. Today’s models feature a patented ‘planetary’ mixing action that ensures your ingredients are mixed quickly and thoroughly every time, and their powerful but quiet 10 speed, direct drive motor means they can handle larger batches and heavier mixing tasks just as easily as lighter, smaller mixing tasks. In a choice of sizes – the Mini with its 3.3 litre bowl, the standard sized 125 model with its 4.8 litre bowl or the 175 model with both a 4.8 litre and a 3 litre bowl – whatever the size of your kitchen there’s a model with the right bowl capacity and footprint to suit, and all three versions feature simple, intuitive controls, making them equally suitable for novice or accomplished cooks. With a single attachment hub to make changing attachments very straightforward, both the Mini and the 125 model come with the same three attachments – a stainless steel 6 wire whisk with aluminium head for gently folding air into eggs and egg whites, whipping light, fluffy cream and making dips and sauces; an aluminium dough hook with non-stick nylon coating for mixing and kneading the perfect yeast dough for bread, pizza and pasta; and an aluminium Artisan flat beater with non-stick nylon coating for heavier mixing tasks such as making cakes, frostings or even mashing potatoes – while the more expensive 175 model also comes with a flex edge beater made from coated metal with a silicone edge to scrape the bowl as it mixes meaning less cleaning up at the end. And when it comes to buying additional attachments that make your Stand Mixer even more versatile in terms of what it can do, you’ll find there’s no end of choice – like the Spiralizer, Citrus Juicer, Sausage Stuffer, Pasta Maker or Slicer & Shredder to name but a few – and because all KitchenAid Artisan Stand Mixer attachments are universal, they’ll fit any of the current models. And just in case you need any more convincing before making your choice, don’t forget the KitchenAid Artisan 175 Stand Mixer, the KitchenAid Artisan 125 Stand Mixer and the KitchenAid Artisan Mini 3.3 L Stand Mixer all come with a 5-year manufacturer’s warranty – just what you need to give you that little extra peace of mind. For more technical specifications and further info on the different models available at Lakeland please click here, or if you’d like to see the Stand Mixers for yourself, just pop into your nearest store where our friendly expert staff would be happy to help you.